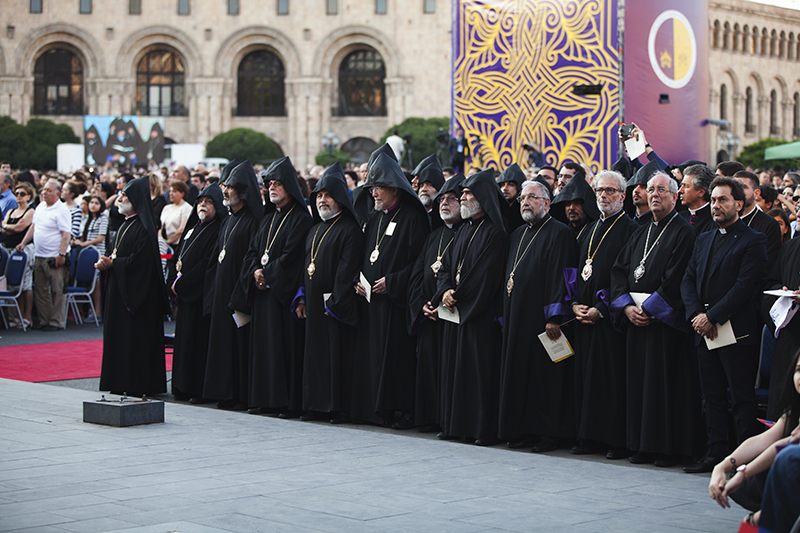 On June 25, under the presidency of His Holiness Karekin II, Supreme Patriarch and Catholicos of All Armenians; and Pope Francis of the Roman Catholic Church; an Ecumenical Service and Peace Prayer was held in the Republic Square of Yerevan. 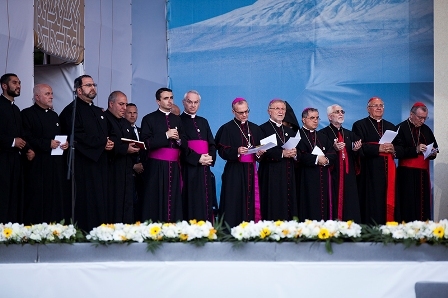 The prayer service was attended by around 60,000 Armenians and guests from different countries from around the world. The Service was attended by Mr. Serzh Sarkisyan, President of the Republic of Armenia; Mr. Galust Sahakyan, RA National Assembly President; Mr. Hovik Abrahamyan, RA Prime Minister; National Assemby deputies, government members and representatives of diplomatic missions. 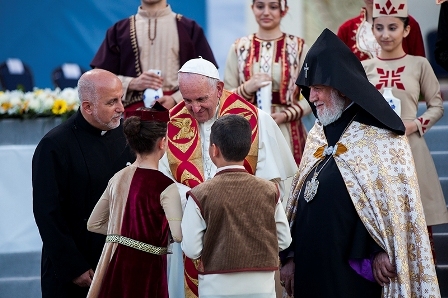 The entrance of His Holiness and Pope Francis was heralded by the ringing of the bells of the churches in Yerevan. The two Pontiffs, along with 12 high-ranking clergymen of each church, ascended the stage, which had been specially prepared for the Service. During the Service, His Eminence Archbishop Shahan Sarkisyan, Primate of the Diocese of Beroea and representative of the Great House of Cilicia; His Eminence Archbishop Avag Asaturyan, Primate of the Armenian Diocese of Iraq; His Grace Bishop Movses Movsisyan, Primate of the Armenian Diocese of South Russia; His Grace Bishop Vasken Mirzakhanyan, Primate of the Armenian Diocese of Georgia; His Grace Bishop Bagrat Galstanyan, Primate of the Diocese of Tavoush; His Grace Bishop Ashot Mnacakanyan, Primate of the Armenian Diocese of Egypt; His Grace Bishop Armash Nalbandyan, Primate of the Armenian Diocese of Damascus; His Grace Bishop Markos Hovhannisyan, Primate of the Armenian Diocese of Ukraine; His Grace Bishop Artak Tigranyan, Director of the Monasteries of the Armenian Church; His Grace Bishop Mkrtich Proshyan, Primate of the Diocese of Aragatsotn; His Grace Bishop Hovakim Manukyan, Primate of the Armenian Diocese of Great Britain and Northern Ireland; and His Grace Bishop Haigazun Najarian, Primate of the Armenian Diocese of Australia and New Zealand, were accompanying the Catholicos of All Armenians. During the joint prayer, passages and prayers from the Holy Bible were read, as well as the Holy Resurrection hymn was sang. During the Service the Catholicos of All Armenians conveyed his blessings and remarks to the attendees. With the praise of the holy name of God Most High on our lips, today in the center of the capital Yerevan, under the blessed gaze of the biblical Mount Ararat, we have gathered together for a joint prayer. From the land of Noah from which God emanated the rainbow of peace, we raised our plea towards heaven together with Our beloved brother in Christ, Pope Francis, for establishment of peace in the world and for a secure and prosperous life. We reflect with emotion that praying with us in this square are also victims of wars, terrorism, and violence who are refugees from Azerbaijan as well as from Syria, and Iraq. With hope in God they wait for peaceful days to arrive in their native lands. Indeed, one and a half decades ago we were greeting the third millennium with the hope that it would be the beginning of coexistence in solidarity among nations and good cooperation among countries for the sake of creating a peaceful and just world. Yet every day we hear troubling news of increased activities of war and acts of terror, unspeakable human suffering, and irreplaceable losses. Children, teenagers, women, and elderly in different corners of the world, of different nationalities, religions and confessions, become the victims of weapons of death and brutal violence, or they choose the path of refugees, overcoming inexplicable difficulties in order to find a haven of safety. Exactly a century ago our nation was walking on this same path, finding herself in a grave situation, where because of the Armenian Genocide she had lost the majority of the homeland, and having one and a half million innocent martyrs, was fighting for the right of her existence. Today as well our nation lives under the difficult situation of an undeclared war, protecting peace within the borders of our country at a heavy price and the right of the people of Nagorno-Karabakh to live in freedom in their maternal cradle. In response to our people’s peaceful aspirations, Azerbaijan violated the ceasefire and began military operations on the borders of the Republic of Nagorno-Karabakh in the month of April. Armenian villages were bombarded and destroyed, soldiers who were protecting the peace as well as school-aged children were killed and wounded, peaceful and unarmed civilians were tortured. By confronting these difficulties our people also feel empathy, for the ruins and losses which are continuing in the Near East, for the acts of terror that have occurred in major European cities, in Russia, the United States, Asia and Africa, and for the religious and cultural heritages which are unsparingly being destroyed in the conflict zones. How many sacred sites were desecrated and valuable artifacts destroyed in Syria, Iraq, and in the countries of the East and Africa? How many cross stones were destroyed in Azerbaijan? Buried under the wreckage, pain of loss and need, are the values and emotions of human souls. In such situations, the mission of the Christian churches and religious leaders cannot only be confined to helping the victims, consoling them, and giving pastoral care. More practical steps must be taken on the road to searching for peace by consolidating our efforts in preventing evil, by fostering the spirit of love, solidarity and cooperation in the societies through ecumenical and interfaith dialogue, according to God’s command, “Blessed are the peacemakers, for they will be called children of God” (Matthew 5:9). Led by the same principle, in the last year new countries and organizations, once and for all condemned the Armenian Genocide, including Germany which was an ally of Turkey during the First World War, who in recent days recognized the Genocide committed against the Armenians. Our people are grateful to Your Holiness and to all who advocate for and protect justice, and anticipate that Turkey, following Your message and the plea of many countries as well as international institutions, will demonstrate enough bravery to face their history, to end the illegal blockade of Armenia and to cease from supporting Azerbaijan’s militaristic provocations targeted against the right of the people of Nagorno-Karabakh to live in freedom and peace. Indeed, peace cannot be realized without justice, human lives cannot become the subject of speculations and cannot be neglected. As the apostle says, “God shows no partiality, but in every nation anyone who fears him and does what is right is acceptable to him.” (Acts 10:34-35). Only justice that is rooted in the protection of rights of individuals and nations, can become a strong foundation for prevention of crimes committed against humanity, and the most successful path towards comprehensive conflict resolution. It is with an eager heart that we beseech God for the realization of this objective, so that He may hear our prayers and by abundantly pouring the graces of the Holy Spirit, He may crown the brotherly love and cooperation of the Churches with fruitful results. May our merciful Lord cleanse the world from the tragedies of evil and grant peace and protection, and as the prophetic words state, they shall beat their swords into plowshares, their spears into pruning hooks, nation shall not lift up sword against nation, neither shall they learn war any more. (Isaiah 2:4). Having in our hearts the spiritual joy of our meeting, which is grated to us by our benevolent God, we beseech our Lord and Savior for His grace and peace for us all, and invite You, Our beloved Brother in Christ, to deliver Your message and convey Your abundant blessings to the thousands of faithful gathered here. In recent years the visits and meetings between our Churches, always cordial and often memorable, have, thank God, increased. Providence has willed that on this day commemorating the Holy Apostles of Christ we meet once again to confirm the apostolic communion between us. I am most grateful to God for the “real and profound unity” between our Churches (cf. JOHN PAUL II, Ecumenical Celebration, Yerevan, 26 September 2001: Insegnamenti XXIV/2 , 466), and I thank you for your often heroic fidelity to the Gospel, which is a priceless gift for all Christians. Our presence here is not an exchange of ideas, but of gifts (cf. ID., Ut Unum Sint, 28): we are reaping what the Spirit has sown in us as a gift for each (cf. Evangelii Gaudium, 246). With great joy, we are walking together on a journey that has already taken us far, and we look confidently towards the day when by God’s help we shall be united around the altar of Christ’s sacrifice in the fullness of Eucharistic communion. As we pursue that greatly desired goal, we are joined in a common pilgrimage; we walk with one another with “sincere trust in our fellow pilgrims, putting aside all suspicion and mistrust” (ibid., 244). On this journey, we have been preceded by, and walk with, many witnesses, particularly all those martyrs who sealed our common faith in Christ by their blood. They are our stars in heaven, shining upon us here below and pointing out the path towards full communion. Among the great Fathers, I would mention the saintly Catholicos Nerses Shnorhali. He showed an extraordinary love for his people and their traditions, as well as a lively concern for other Churches. Tireless in seeking unity, he sought to achieve Christ’s will that those who believe “may all be one” (Jn 17:21). Unity does not have to do with strategic advantages sought out of mutual self-interest. Rather, it is what Jesus requires of us and what we ourselves must strive to attain with good will, constant effort and consistent witness, in the fulfilment of our mission of bringing the Gospel to the world. Saint Nerses spoke of the need to grow in mutual love, since charity alone can heal memories and bind up past wounds. Memory alone erases prejudices and makes us see that openness to our brothers and sisters can purify and elevate our own convictions. For the sainted Catholicos, the journey towards unity necessarily involves imitating the love of Christ, who, “though he was rich” (2 Cor 8:9), “humbled himself” (Phil 2:8). Following Christ’s example, we are called to find the courage needed to abandon rigid opinions and personal interests in the name of the love that bends low and bestows itself, in the name of the humble love that is the blessed oil of the Christian life, the precious spiritual balm that heals, strengthens and sanctifies. “Let us make up for our shortcomings in harmony and charity”, wrote Saint Nerses (Lettere del Signore Nerses Shnorhali, Catholicos degli Armeni, Venice, 1873, 316), and even – he suggested – with a particular gentleness of love capable of softening the hardness of the heart of Christians, for they too are often concerned only with themselves and their own advantage. Humble and generous love, not the calculation of benefits, attracts the mercy of the Father, the blessing of Christ and the outpouring of the Holy Spirit. By praying and “loving one another deeply from the heart” (cf. 1 Pet 1:22), in humility and openness of spirit, we prepare ourselves to receive God’s gift of unity. Let us pursue our journey with determination; indeed, let us race towards our full communion! Dear young people, this future belongs to you. Cherish the great wisdom of your elders and strive to be peacemakers: not content with the status quo, but actively engaged in building the culture of encounter and reconciliation. May God bless your future and “grant that the people of Armenia and Turkey take up again the path of reconciliation, and may peace also spring forth in Nagorno Karabakh (Message to the Armenians, 12 April 2015). In this perspective, I would like lastly to mention another great witness and builder of Christ’s peace, Saint Gregory of Narek, whom I have proclaimed a Doctor of the Church. He could also be defined as a “Doctor of Peace”. Thus he wrote in the extraordinary Book that I like to consider the “spiritual constitution of the Armenian people”: “Remember [Lord,] those of the human race who are our enemies as well, and for their benefit accord them pardon and mercy… Do not destroy those who persecute me, but reform them; root out the vile ways of this world, and plant the good in me and them” (Book of Lamentations, 83, 1-2). Narek, “profoundly conscious of sharing in every need” (ibid., 3, 2), sought also to identify with the weak and sinners of every time and place in order to intercede on behalf of all (cf. ibid., 31, 3; 32, 1; 47, 2). He became “the intercessor of the whole world” (ibid., 28, 2). This, his universal solidarity with humanity, is a great Christian message of peace, a heartfelt plea of mercy for all. Armenians are present in so many countries of the world; from here, I wish fraternally to embrace everyone. I encourage all of you, everywhere, to give voice to this desire for fellowship, to be “ambassadors of peace” (JOHN PAUL II, Apostolic Letter for the 1700th anniversary of the Baptism of the Armenian People, 7: Insegnamenti XXIV/1 , 278). The whole world needs this message, it needs your presence, it needs your purest witness. Peace to you! Following the remarks, during the singing of “Christ came into us”, the Pontiffs greeted each other then conveyed their blessings to the attending thousands of people. Pope Francis blessed the attendees through the prayer “Keep us, Christ our God”. 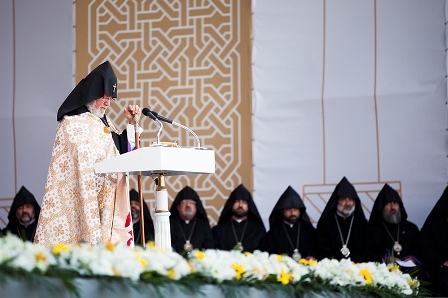 At the conclusion of the Service, His Grace Bishop Armash Nalbandyan, Primate of the Armenian Diocese of Damascus, also made remarks: “I have come to attend this Peace Prayer Service from Syria, a country which continues to suffer from the lack of peace. For many years war and terrorism do not end here, as a result of which numerous innocent people are killed or become refugees; including children, elderly and women. Settlements, churches and mosques, schools and hospitals are destroyed. It was in the recent past, three years ago that the Holy Martyrs Church which housed the relics of the Holy Martyrs of the Armenian Genocide was blown up in the Syrian desert of Der Zor. Today, in the presence of the President of the Republic of Armenia and under the presidency of His Holiness Karekin II and Pope Francis, through a joint prayer, we offered our prayers for the peace and stability of the world, this region and our beloved Armenia. 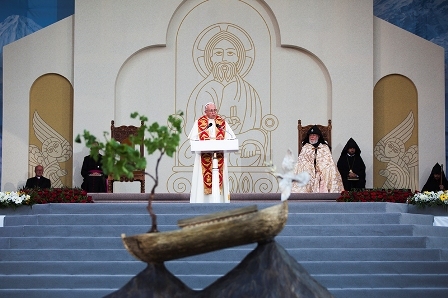 Your Holiness, on the occasion of your historic visit to Armenia, which you call a pilgrimage, on behalf of our people You will be handed a symbolic gift – a sculpture of Noah’s Ark. Noah’s Ark, which descended to the top of Mount Ararat is the enduring symbol of mankind’s salvation and rebirth. In the recent years, Armenia became such an ark of salvation for thousands of families who became refugees in the Middle East and who are the descendants of Armenians who survived the Armenian Genocide. And now, Armenians arrived from Syria, Iraq, Lebanon, the United Arab Emirates, Egypt, Turkey, Israel, Jordan, Kuwait and Iran will add one handful of soil brought with them into this Ark where an Armenian grape cutting will be planted. Let this symbolic gift be a lasting memory of the Armenian world in the St. Peter Cathedral, as a remembrance of this soul-stirring Service which was offered for world peace”. Following the remarks, Ave Maria was performed by jazz artist Gary Kesayn following which, children from the Middle East offered His Holiness and Pope Francis the soil brought from their countries for blessings. 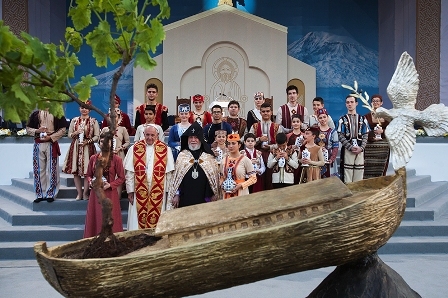 Following the blessing, the children dressed in historical Armenia costumes, placed the soil into the miniature of Noah’s Ark and the Armenian grape cutting was planted there. The author of the sculpture is designer and artist Michael Aram from America. At the conclusion of the Service, the National Philharmonic Orchestra of Armenia, led by Mr. Eduard Topchyan, and the National Academic Choir of Armenia, led by Mr. Hovhannes Chekijyan, National Artist of Armenia, and as well as with the participation of renowned soloists of Armenian classical music, performed a concert program. This entry was posted in Featured News, News and tagged Armenian Diocese, Armenian Genocide, Azerbaijan, Pope Francis, Syria by Orthodoxy Cognate PAGE. Bookmark the permalink.